Through our extensive worldwide client contacts we export over 70% of our used machines abroad. 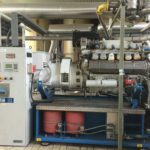 In collaboration with our expert partners, carda-engineering offers many years of experience in dismantling and transportation of Used Filter Press – Decanter Centrifuge – Mixers – Pumps. With our partners we can support you in the assessment and revision of used process equipment. A machine is called a used machine if it had at least one previous owner. This may be a machine in mint condition with only a few working hours to a used machine with high mileage. In a short time and with low cost and effort, these machines can be brought into a functional and operational condition. The machines are usually dismantled and no longer in service. Many production machines can often still be seen in operation. Careful removal of the equipment is a prerequisite for a trouble-free recommissioning. Please contact us if you can not find a particular machine, we are glad to help you. If you have surplus machinery, we would be happy if you offer it to us. In either case, we can assist you.